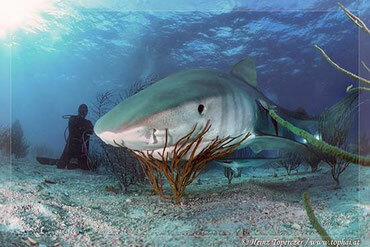 There are more than 465 known species of sharks living in our oceans today. Of these, around 180 species occur in Australian waters, of which about 70 are thought to be endemic (found only in Australian waters). Sharks occur in all habitats around the Australian coast line, however most are found on the continental slope or shelf, primarily on the bottom. However, many sharks are also found in coastal waters and a small number are even found in freshwater systems, such as rivers and estuaries. 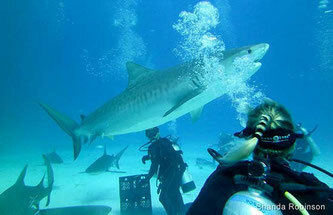 Sharks belong to a family of fish that have skeletons made of cartilage, a tissue more flexible and lighter than bone. They breathe through a series of five to seven gill slits located on either side of their bodies. All sharks have multiple rows of teeth, and while they lose teeth on a regular basis, new teeth continue to grow in and replace those they lose. Tiger Shark, image from http://www.seashepherd.org.au/apex-harmony/overview/shark-facts.html. Most sharks are especially active in the evening and night when they hunt. Some sharks migrate over great distances to feed and breed. This can take them over entire ocean basins. While some shark species are solitary, others display social behavior at various levels. Hammerhead sharks, for instance, school during mating season around sea-mounts and islands. The largest shark cull program in Australia began in Queensland in 1962, when the government installed drum lines and shark nets along popular beaches in the Sunshine Coast, Gold Coast and Cairns. Townsville and Mackay followed in 1963, when devices to capture and kill marine life were installed in these locations, including around Magnetic Island on Australia’s Great Barrier Reef. The program grew as Rockhampton (1969), Bundaberg (1973), Rainbow Beach (1974), Tannum Sands (1983) and Point Lookout (1984) were all to follow as the years passed on. As of 2014, there is a total of more than 360 drum lines and 30 shark nets deployed along the coast, which cause death and injury to thousands of marine animals each year. Many drum lines and shark nets are situated within marine protected areas along the Queensland coast, including the Great Barrier Reef Marine Park, Great Sandy Straits Marine Park and Moreton Bay Marine Park. All drum lines and a majority of shark nets are in place all year round in Queensland. 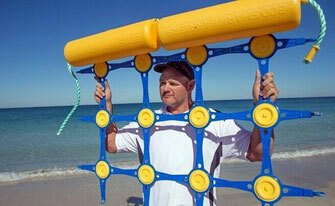 Baited drum lines and shark nets set 300m - 500m from the coastline do not provide a screen to ensure complete safety of the general public using Queensland beaches. 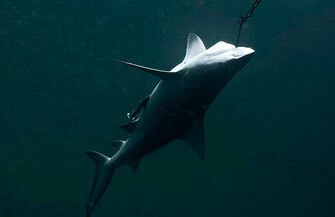 Experts have often warned that using baited hooks to attract feeding sharks close to beaches could potential increase the risk of human-shark encounters. Many sharks in Queensland have also been found in shark control equipment sporting large bite marks or body parts missing, indicating that larger sharks are using baited drum lines and nets as a means to prey upon animals already caught on the devices. Shark nets used in Queensland are at a length of 186 metres and, contrary to popular belief do not provide a complete barrier or enclosure to ensure swimmer protection. In fact, many sharks and other marine animals caught in shark nets off Queensland are found along the ‘beach side’ of the net. Different states in Australia are researching, trialing and testing various shark bite mitigation strategies. Millions are being poured into initiatives such as helicopter patrols, tagging and tracking sharks, shark nets, masking the sounds of people in the ocean, broadcasting Orca sounds underwater, drum lines and various repellents. In addition to what the governments are looking into, private investors are also trialing various programs such as electronic deterrents, drones, the Eco Shark Barrier at a local beach in Perth, and smart phone applications which use social media to advise the community of where sharks are spotted. Around the world, shark mitigation strategies that do not harm delicate marine ecosystems are also being explored. In Brazil, the government has partnered with scientists to catch sharks around 2kms from shore, tag and tow them about 8kms away from popular beaches, resulting in a reduction of shark incidents by 97%. 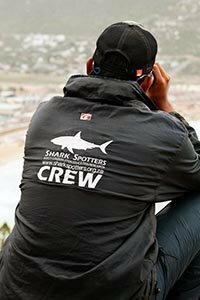 In South Africa, the popular Shark Spotters program, started in 2006 by the surfing community, uses a flag and alarm system to keep watch on swimmers and surfers at popular beaches in Cape Town, for a minimum of 10 hours or more, 365 days a year. Around the world, shark mitigation strategies that do not harm delicate marine ecosystems are also being explored. In Brazil, the government has partnered with scientists to catch sharks around 2kms from shore, tag and tow them about 8kms away from popular beaches, resulting in a reduction of shark incidents by 97%. In South Africa, the popular Shark Spotters program, started in 2006 by the surfing community, uses a flag and alarm system to keep watch on swimmers and surfers at popular beaches in Cape Town, for a minimum of 10 hours or more, 365 days a year. Evidence from Hawaii, where more than 4,500 sharks were killed between 1956 and 1976 in a state-imposed shark cull, illustrated that there was no significant decreased in the rate of shark bites as a result of the cull. Additionally, a 2012 report, commissioned by the Western Australian Government rejected the use of drum lines as an effective option to reduce shark bite risk. In fact, drum lines may actually increase safety issue where they are deployed near the coastline. The round-the-clock deployment, close to the shoreline, means that catches are unattended for long periods of time. These injured or dead sharks can potentially attract larger sharks; which was seen during the drum line trial when a juvenile shark was pulled up with its stomach torn open and its tail missing.